by Dhananjay Ghei and Shubho Roy. When dealing with distress, the single big idea for avoiding value destruction is speed of action. Delays destroy value. When we cope with failing firms (through a bankruptcy code) or failing banks (through a resolution corporation), the measure of institutional quality is the recovery rate, and the key determinant of the recovery rate is speed of action. The conventional method for assessing delays is to run a survey of insolvency practitioners (judges, lawyers, accountants). In this article, we offer a new idea for measuring one part of the delay. There are many parts of the bankruptcy process. Many societies try to avoid the problem of failed firms by putting things off. This leads to a delay between the actual firm failure and the commencement of the formal bankruptcy process. Could this be measured directly? We could start from the date of the end (the date of the official legal action about firm closure), and look back to the date on which extreme credit distress is identified. The gap between the two events will serve as a proxy for delays of the bankruptcy process. Let's play this idea out with the failure of Kingfisher Airlines. The decisive end date is 18th November, 2016, when the Karnataka High Court ordered the winding up of Kingfisher Airlines (See here). Conventional notion of delay: The case was filed by an unsecured (foreign) creditor on 18th September, 2012. It took the legal system four years to come to the conclusion that Kingfisher Airlines is insolvent. Distress is where the ICR falls below 1 in any year. 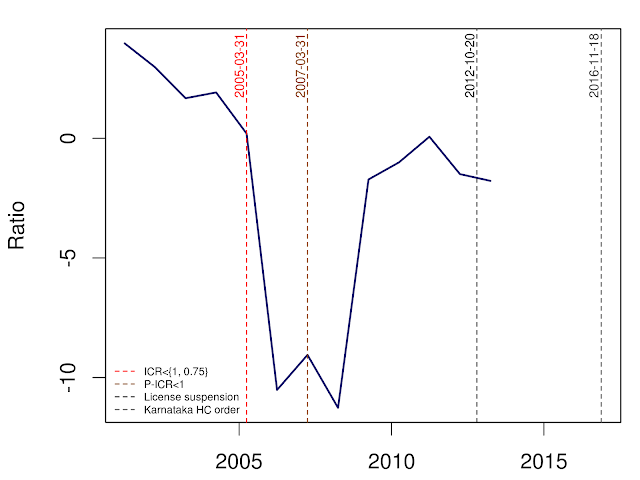 Example: Claessens, Djankov, and Lang 1998..
Distress is where the ICR for any financial year falls below 0.75. Example: Love, 2010. We extract the annual financial data for Kingfisher Airlines from CMIE Prowess database. The data is available from March 2001 till March 2013. Figure 1 below shows when Kingfisher Airlines met these criteria. It broke into ICR-below-1 and ICR-below-0.75 in March 2005 (red line) and it achieved P-ICR in March 2007 (orange line). The court finally ordered winding up 3520 days after Kingfisher meeting all the three criteria (gray line). The black line (October 20, 2012) is when DGCA suspended Kingfisher's license. Looking back using Distance to Default as a measure of credit stress. Distance to Default (DtD) is measured as the difference between the asset value of the firm and the face value of its debt, scaled by the standard deviation of firm's asset value. It measures the distance (in standard deviations) between the expected value of the firm and the "default point" (face value of the debt). Thus, lower values of DtD imply that the firm is more likely to default on its financial obligations. DtD is implemented in R using the ifrogs package developed by IGIDR Finance Research Group. Figure 2 shows the DtD for Kingfisher Airlines from June 2007 onwards. As the listing took place on 12 June 2006, the DtD calculation only commences on 12 June 2007. The red line shows the date when DtD was below 1 for the first time (August 1, 2008). DtD reached its lowest value of 0.30 on July 6, 2009 (orange line). Thus, at that point the likelihood of default was the highest (19 percent). The approach shown above with Kingfisher is potentially scalable into large datasets and all countries. This could yield large-scale measurement, at the level of individual bankruptcy transactions, about delays. This can yield useful summary statistics. The new insolvency law should reduce the time between financial insolvency and the legal recognition of the same. This should yield measurable gains when these techniques are applied to the data in the future. Our approach yields micro data about delays which can be analysed in order to explore cross-sectional and time-series variation. Such analysis is not feasible with the conventional measurement of delays that is based on surveying practitioners. Dhananjay Ghei and Shubho Roy are researchers at the National Institute for Public Finance and Policy. The authors would like to thank Radhika Pandey, Rajat Kochhar and Mohit Desai for their inputs. How are you computing "expected asset value" for calculation of Dtd? Are you extracting the present value of asset from equity value using black scholes method. Are you using total debt of the company in Dtd Calculation? Or are you using short term debt (to be paid immediately) for your dtd calculation. 3) Why not use event based indicators of distress? Dtd based measures can have high value of type 2 error. Event based measures are much better. 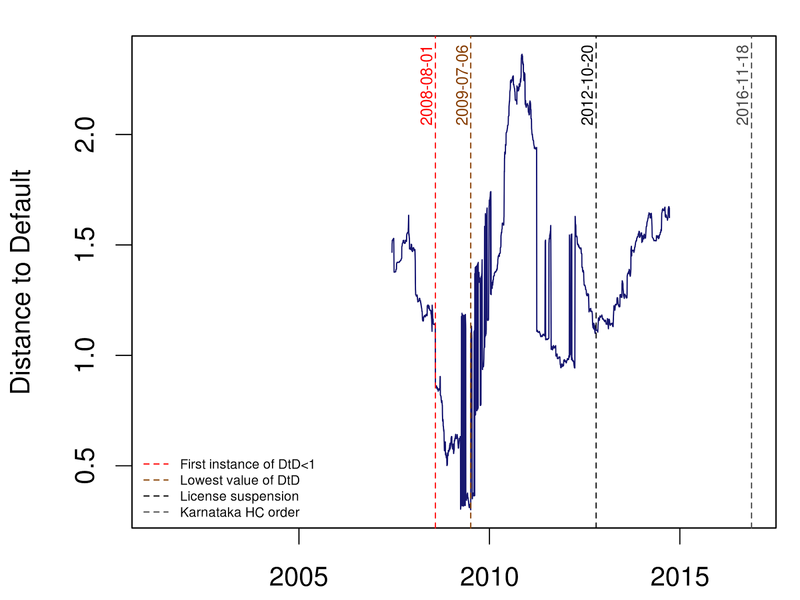 For example, in banking risk management, delinquency event (>90) are much stronger indicators of possible default. In addition, these events do not have complex computation requirement like using prevalent black scholes formula.